He was found walking alone down a country road in Olivehurst, CA last November. Discarded. Right ear ripped off. Left ear nearly gone. Fresh tear marks on his neck. 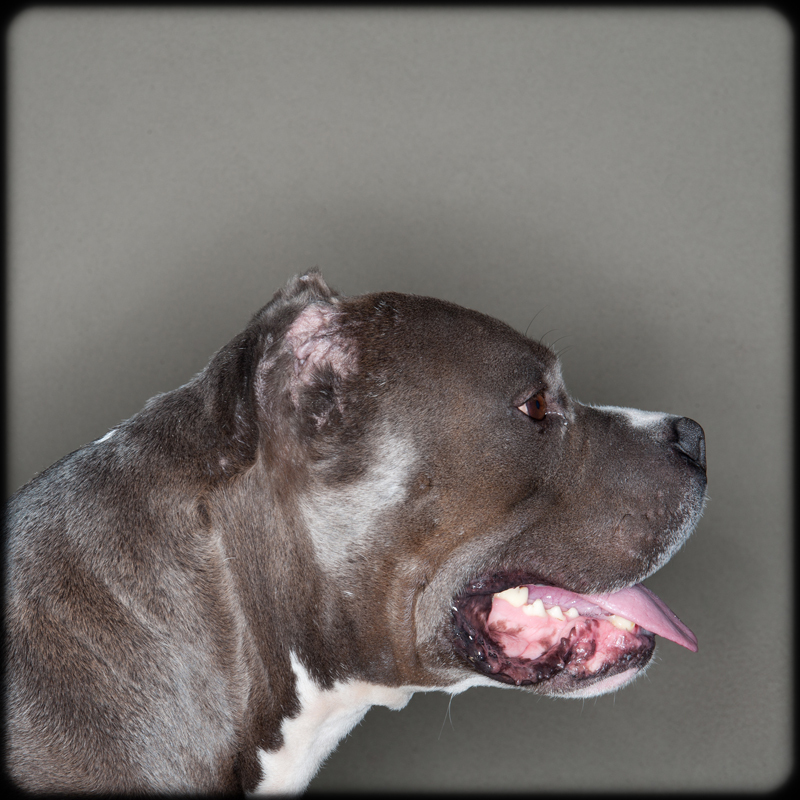 His swollen head was covered in bite marks, scabs and scars. So were his legs and belly. The swelling was so bad that his ears were swollen shut. He was twenty pounds underweight. A woman found him and called the local animal control. They took him to their nearby vet clinic. Despite being so beat up, the vet said he was very friendly. Showed no aggression despite being in obvious pain. He stitched him up. Put drains in his ears. From there he went to a Yolo County shelter where he was scheduled to be euthanized. A woman who has a mutual friend to Amber and is involved in rescue, pulled him from the euthanasia list if she would come and adopt him within two days. In mid-November Fathead went home. To a real home. The next row of photos are Amber’s. The photo that is tough to look at is what is left of his right ear. The ear itself is still swollen shut in the photo. The stitches are to put back together the tiny scrap of skin of what was left of the ear. She crated him in her kitchen to keep him quiet and heal. He was on Clindamycin, Cephalexin, Rimadyl, Drontal, Posatex Otic Suspension, and Ciprofloxacin. Lots of pill once a day, twice a day, every 12 hours, for 8 eight days, for 10 days, for 15 days, drops for the ears, some more for the tape worms. But it is Amber’s love that healed this dog. She nursed him to health with the help of her boyfriend, Keith Cruz. They taught him it was okay to be loved. She says, “You could tell he had been through a lot. He wouldn’t look at you at first. I had to pick him up and put him in my lap. He was extremely afraid.” Amber says he is so sweet and now loves to cuddle. Because his nature is so gentle, she hopes to get him into therapy work, work to make someone else happy, to give someone else a boost, to show just how capable dogs are of forgiving. Amber has had dogs her whole life. 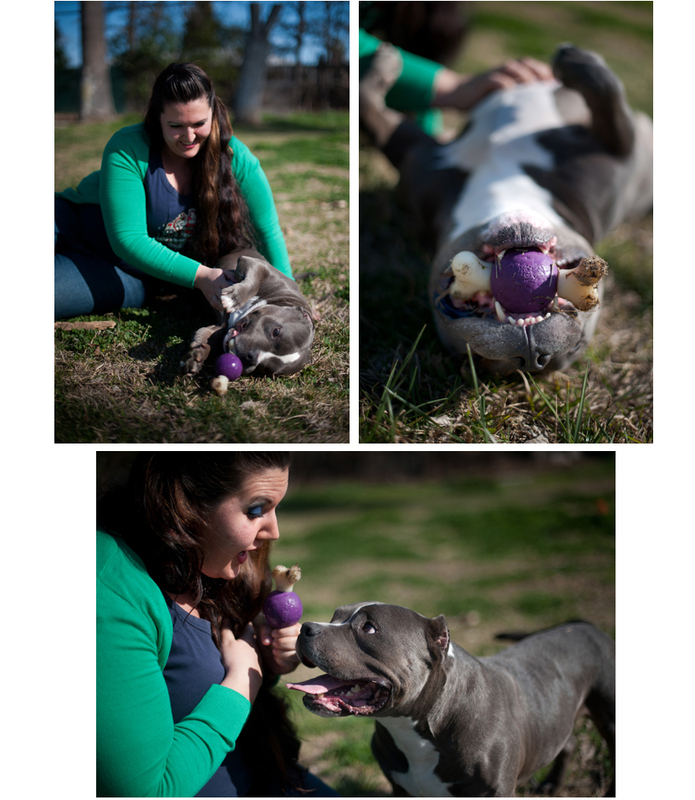 She’s worked at the Oakland SPCA, a doggie daycare in San Francisco, a mobile vet. She trains them. Loves them. Gives them a good life and will surely rescue many more dogs. Fathead is now a happy dog. His fur has grown back. The scabs healed. The scars covered up. He has a limp from his past life that may eventually require surgery, but he’s not letting it slow him down. He has a large yard and playmates, and a chew toy that is ever present. Life is good. 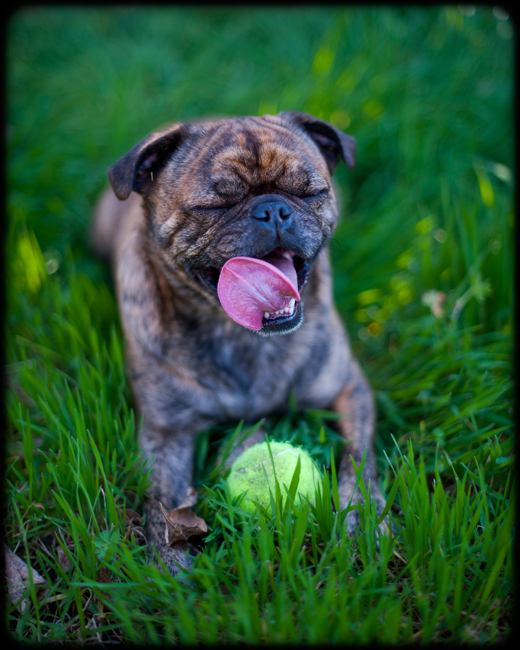 Cash, a brindle pug/Boston terrier mix, is one of Fathead’s playmates. He is faster than he looks and loves to chase that ball. Amber is fostering two dogs she found in her neighborhood. Emmy Lou, a tan and white pit bull was seen being dumped in a local park within hours of giving birth. The puppies were nowhere in sight. Amber took her to the vet for a check-up. She says Emmy Lou is an extreme cuddle bug and loves attention. She loves sunbathing on the couch as the light spills in. She is a medium energy dog and knows her basic commands like sit, stay, and lie down. She is crate trained, house broken, and likes kids. She plays well with other dogs. 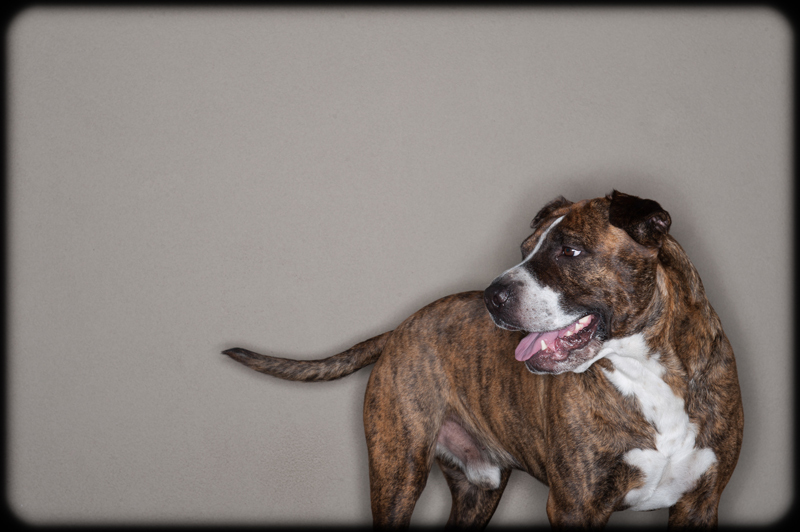 Amber found Huey Lewis, a pit bull/sharpei mix on Jan 14th wandering down the street near her house. He had a hole in his neck. She took him to the vet and had him fixed up. He is house broken and crate trained. 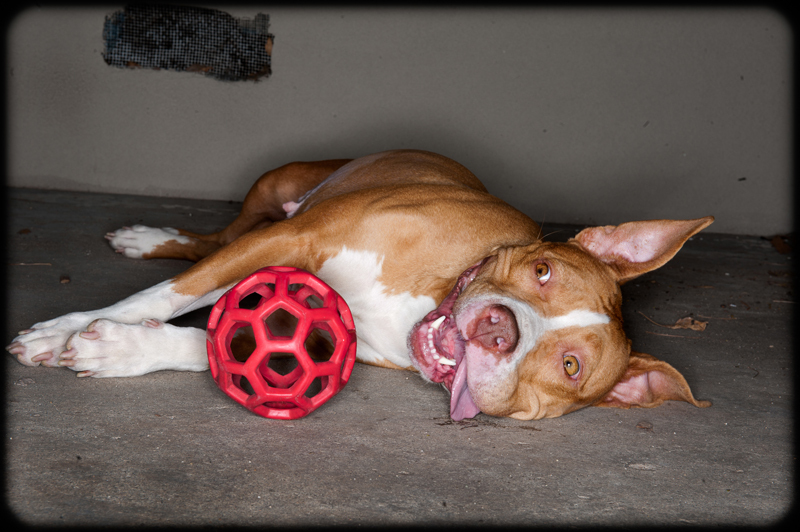 He is a medium energy dog who loves to play fetch, loves the water, loves to hike, loves to snuggle. He is good with other dogs and kids. He knows basic commands like sit, stay, and down. He has no destructive behaviors and does well outside of the crate when left home alone.